Microsoft Office 97 Small Business Edition provides everything you need to master the tasks you do every day. Whether you're creating documents' assembling and analyzing information' communicating with customers' or publishing marketing materials' you'll find all the essential tools in this easy-to-use' integrated office suite. Creating professional-looking documents is easy in Office 97 Small Business Edition with intelligent' intuitive features such as Spell It' Grammar Check' and AutoCorrect. Helpful wizards are there to walk you through creating everything from letters and memos to brochures and Web sites. Plus' find the meaning behind your business's numbers easily with advanced charting' reporting' and analysis tools. 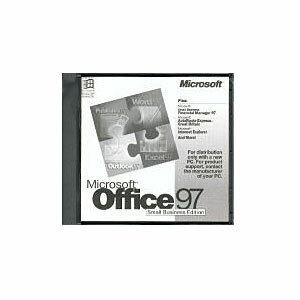 Office 97 Small Business Edition also helps you to bring people and information together. Communicate with clients' vendors' and employees easily' and manage contacts' tasks' and schedules from one central location. And it's all integrated' making it a snap to build detailed maps from your contact information to pinpoint clients in any U.S. city. Now it's easy to do your best work with the complete' integrated tools in Office 97 Small Business Edition!! OEM: End-User must purchase with qualifying hardware to have a valid licence with this product!! Word 97 is the anchor of this suite acting as your word processor. With features like saving documents in HTML format, integrating tightly as an email editor and providing more features than many stand-alone desktop publishing programs, Word 97 will be the program you use most often. Excel 97 performs its job as a powerful spreadsheet application. Cell capacity is more than 65,000 rows and 32,000 characters per cell. A new feature of "cell validation" can determine if data entered in a cell is in the proper format. Entering a URL into a cell and multiple "undo's" are now possible also. 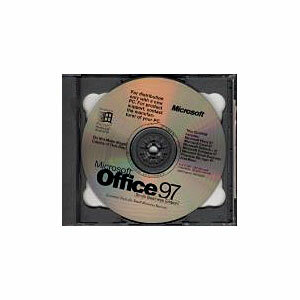 Publisher 97 is the 'DTP' of the office 97 suite. This is one of the easiest DTP programs to master and it comes with some 'wizard' driven, templates to help you along. With the new additions of 'mail merge' and web page design, Publisher 97 will easily get you and your company looking like you have a professional designing department working for you. Outlook 97 acts as an organized and integrated desktop for the other applications. It will assist you in organizing routine computing activities by integrating E-mail, scheduling, contacts, and "to-do" tasks and completely change the way you access information.